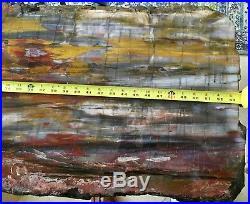 Petrified Wood solid Slab Table Top with hand forged base by American artisan David Gibson. 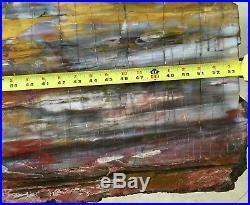 This is a gorgeous specimen of petrified wood enhanced by the hand forged base of which it sits. A beautiful conversation piece for your home. American Artisan David Gibson created the hand forged base. 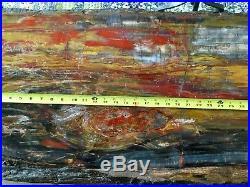 Petrified wood found in the park and the surrounding region is made up of almost solid quartz. Each piece is like a giant crystal, often sparkling in the sunlight as if covered by glitter. The rainbow of colors is produced by impurities in the quartz, such as iron, carbon, and manganese. 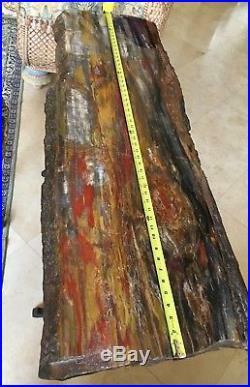 About 200 million years ago, this log and wood like it were washed into an ancient river system and were buried quick enough and deep enough by massive amounts of sediment and debris also carried in the water, that oxygen was cut off and decay slowed to a process that would now take centuries. Minerals, including silica dissolved from volcanic ash, absorbed into the porous wood over hundreds and thousands of years crystallized within the cellular structure, replacing the organic material as it broke down over time. Sometimes crushing or decay left cracks in the logs. Here, large jewel-like crystals of clear quartz, purple amethyst, yellow citrine, labradorite smoky quartz formed. 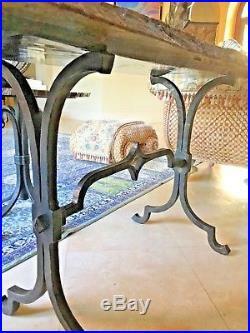 This table is an excellent example this process. Triassic Periord 180-230 Million years age. Private ranchlands in Arizona. 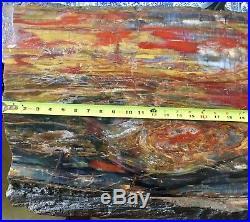 Petrified Wood & hand forged base by artisan David Gibson. Palm Beach County, FL. 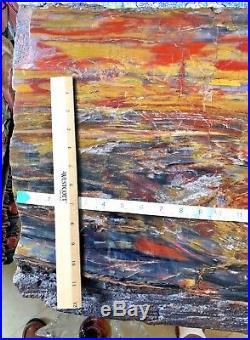 W: 18″ X 29″ Slab: 2 thick. Is a geologic period and system which spans 50.9 million years from the end of the Permian Period 251.9 million years ago (Mya), to the beginning of the Jurassic Period 201.3 Mya. The Triassic is the first period of the Mesozoic Era. Both the start and end of the period are marked by major extinction events. The Triassic began in the wake of the PermianTriassic extinction event, which left the earth’s biosphere impoverished; it would take well into the middle of this period for life to recover its former diversity. Archosaurs were the chief terrestrial vertebrates during this time. A specialized subgroup of archosaurs, called dinosaurs, first appeared in the Late Triassic but did not become dominant until the succeeding Jurassic Period. The first true mammals, themselves a specialized subgroup of Therapsids, also evolved during this period, as well as the first flying vertebrates, the pterosaurs, who like the dinosaurs were a specialized subgroup of archosaurs. Pangaea existed until the mid-Triassic, after which it began to gradually rift into two separate landmasses, Laurasia to the north and Gondwana to the south. The global climate during the Triassic was mostly hot and dry. With deserts spanning much of Pangaea’s interior. However, the climate shifted and became more humid as Pangaea began to drift apart. The end of the period was marked by yet another major mass extinction, the TriassicJurassic extinction event, that wiped out many groups and allowed dinosaurs to assume dominance in the Jurassic. The Triassic was named in 1834 by Friedrich von Alberti, after the three distinct rock layers (tri meaning “three”) that are found throughout Germany and northwestern Europered beds, capped by marine limestone, followed by a series of terrestrial mud- and. 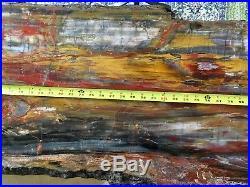 The item “Petrified Wood solid Slab Table Top with hand forged base Exceptional Specimen” is in sale since Monday, April 30, 2018. 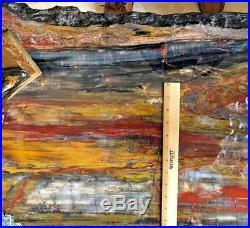 This item is in the category “Collectibles\Rocks, Fossils & Minerals\Fossils\Vegetation\Petrified Wood”. 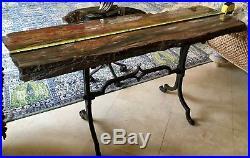 The seller is “elizabetunderwoo-26″ and is located in Palm Beach Gardens, Florida. This item can be shipped worldwide.